Senior midfielder Cole Missimo leaps for a header. The Wildcats were unable to finish near the goal as they were shutout at home against Indiana. 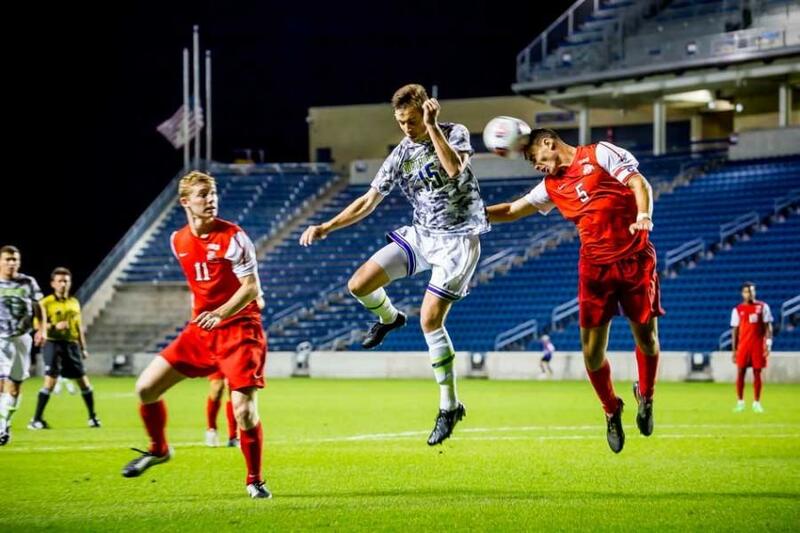 A second-half surge proved fruitless for Northwestern in a 1-0 loss to conference rival Indiana on Sunday afternoon. The Wildcats (3-4-1, 1-2-0 Big Ten) ripped off 10 of their 12 total shots in the second half but were only able to get two on goal in the game. Indiana (5-3-1, 1-2-0) goalkeeper Colin Webb saved both. Hoosiers defender Andrew Gutman scored in the 42nd minute for the lone goal of the game, held at Toyota Park in Bridgeview. Indiana won the 2012 NCAA national title and has appeared in back-to-back Big Ten championship games but opened its conference schedule with losses to Penn State and Rutgers. Coach Tim Lenahan has stressed the need for better starts this season after repeatedly falling behind early in matches; NU nearly flipped the script on Sunday by earning a corner kick and two shots in the first eight minutes. Neither attempt made it on goal, however, and the Cats didn’t create another shot until nearly 50 minutes later. Following NU’s failed attempts, the momentum shifted in Indiana’s favor for the remainder of the first half, and Gutman eventually hit the back of the net on his third shot. The freshman received a pass from midfielder Tanner Thompson and found the space to step into a hard shot from just outside the left corner of the 18-yard box, beating NU goalkeeper Zak Allen after a slight deflection. The Cats spent much of the remainder of the game searching for an equalizer to no avail. After a diving punch by Webb in the 60th minute, junior midfielder Jeffrey Hopson had a look at an open goal but his lofting shot from distance sailed high. Senior forward Joey Calistri created a pair of chances in the 63rd and 67th minutes, but both attempts were blocked. Hopson found himself in another great scoring opportunity in the 86th, but his glancing header off of a corner kick was parried just over the bar. The Cats had a last chance to equalize with a free kick from 25 yards out in the final minute, but sophomore midfielder Sam Forsgren’s shot was saved calmly by Webb. Sunday’s match was the first time this season that NU outshot its opponent. The final whistle, however, marked the continuation of a different trend: the fourth time NU was shut out in its last seven games. The Cats get the entire work week off before visiting Maryland — a team still undefeated (1-0-2) in Big Ten play after a 4-1 Sunday win over Wisconsin — on Friday night.